March - April May - June August Sept - Oct.
Daffodils and early bulbs Blossom of old varieties of Apple, plum and pear. Largest tulip tree in flower Waterlilies and fruit. 12th C. Church and Bell Tower. Public footpath to River Severn. A remarkable restoration by the National Trust has re-created this original Dutch water garden, the only one to survive the era of naturalistic landscaping by the likes of Repton and 'Capability' Brown. Although the exotic varieties of tulips from the famous age of 'tulipomania' are no longer extant, Westbury Court is planted exclusively with species of plants available before 1700. The long canal was the first feature to be created by Maynard Colchester in 1696. 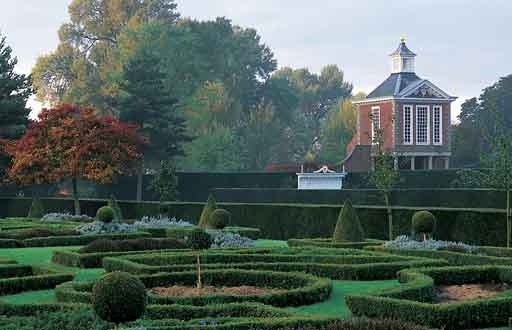 Near it the parterre in box with its conical and ball shaped topiary contained within yew hedges, some of which also sport cones, provides a formal and graceful surround to the Tall Pavilion. Many old varieties of apple and plum trees are espaliered here as well as peaches, apricots and cherries and round them are planted daffodils, anemones, muscari and ranunculus. There is a small walled garden growing a collection of perennials of the 17th century. Two magnificent trees, a Tulip tree and Holm Oak, probably dating from before Maynard Colchester's time, dominate the formal garden, the oak in particular being one of the largest and oldest in the country. Views of the neighbouring countryside are limited to those through two ironwork grilles in the North Wall, contributing to the intimate atmosphere of the garden. The vegetable plots have been recreated to grow fruit and vegetable varieties from the 17th century. Laid out between 1696-1715 by Maynard Colchester, and possibly influenced by his Dutch neighbour, Catherine Boevey of Flaxley Abbey, its further development was carried in the hands of his nephew, also named Maynard Colchester. The garden came to National Trust in 1967 in a very sorry state and it became their first garden restoration, starting in 1971.